I was bored while messing around on my day on the land. I decided to sneak into an event where a master chef was giving a live demonstration. However me cover was blown away when I was welcomed by people in the event. "What was so sneaky about that anymore?" I grumbled. I quietly sat down as the chef put together a fine dessert. 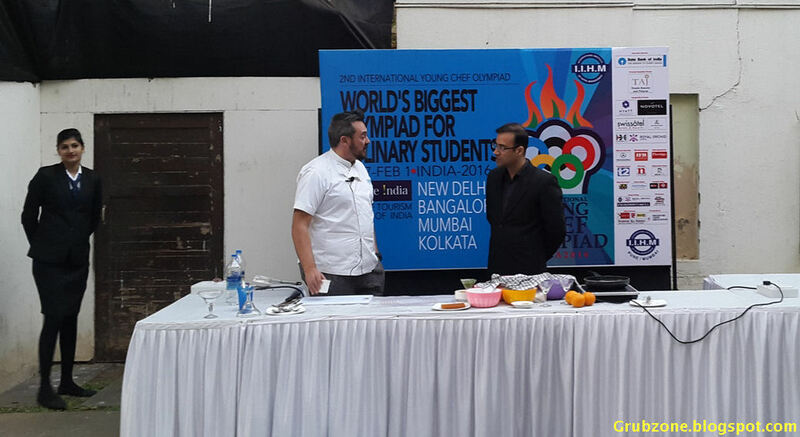 IIHM(International Institute of Hotel management) has officially launched the second International young chef Olympiad. This contest will see sixty seven of the best student chefs from sixty seven different countries cook it off against each other. And may the tastiest grub maker win. Think of this as a master chef contest but less smoke and mirrors and more cooking. There is a prize of ten grand waiting for the winner and probably an aromatic future ahead. Great chefs will be born in this contest and us folks in India get to see it happen. The contest will run between Jan 26 to Feb 2. And it will come to my city Mumbai on the 29th. 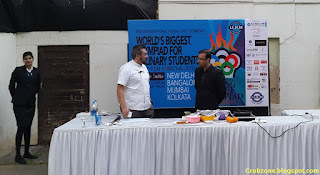 To celebrate this event, IIHM decided to host a small master class with renowned dessert chef Shaun Kenworthy who has been cooking for more than three decades. 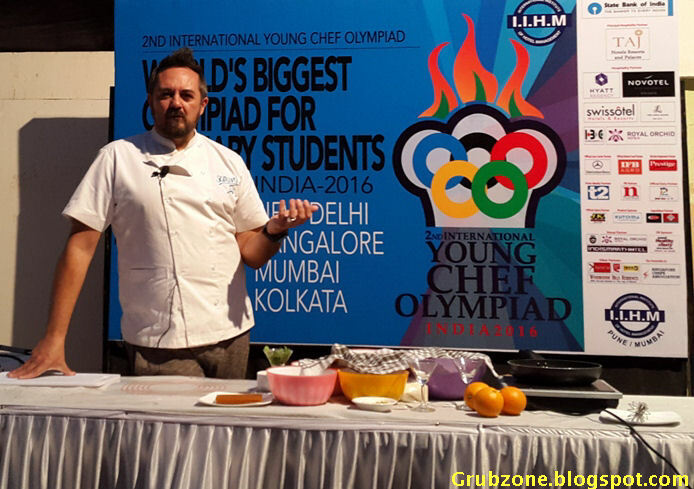 Chef Shaun also happens to be the chief mentor of IIHM and its likely that one shall see his protege compete in this contest too. The master showed me a culinary miracle on this windy evening under tree shades. Lets say that it was a taste of things to come. Whipping up an "Indian Trifle", Chef Shaun ditched the traditional custard and used Mishti Doi as the base ingredient for this unique Trifle. Indeed, he completely transformed a very British delight into a very Indian one. 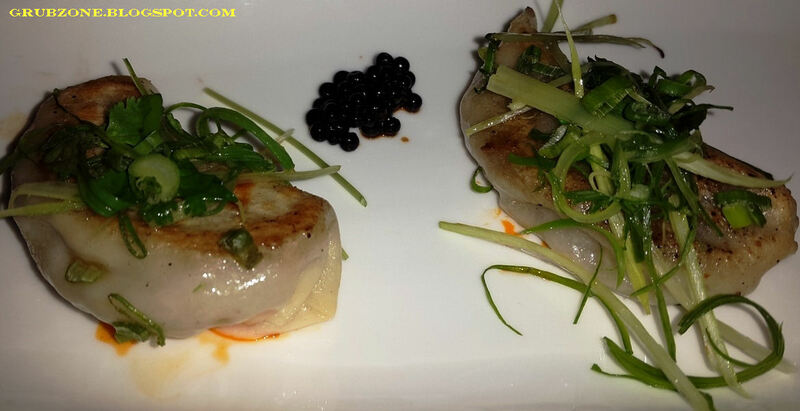 See the pictures from top to bottom for the evolution of this dish as it happened. What was magical about this experience was that Chef Shaun used common ingredients. Nothing fancy at all. One need not go to the gourmet mart or a fancy deli to get exotic ingredients. One can buy these from the local grocers and fruit shops. Even the caramel string ball was made from common sugar right in front of me. Shaun made it look so easy. I know that I cannot replicate that shining caramel structure. Using common over the counter ingredients to make a colorful fine dine masterpiece, that is something only a master can do. And he did it in just twenty minutes. 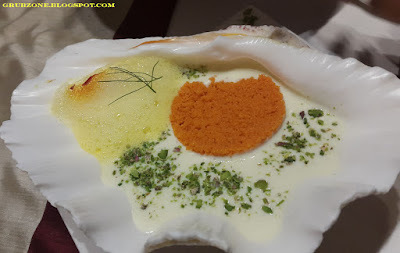 Mishti Doi, Tropical fruits, strawberries, Aam Papad, Whip cream quenelle, regular sugar, some colorful candy and voila Indian Trifle. And if that wasn't enough, he simultaneously made this one on the side. That is some sweetly colorful multi tasking. One can say that Chef Shaun's students are in good hands with him as their master. Now I look forward to the IIHM Olympiad that comes to Mumbai on the 29th. I would obviously cheer for my country's team but may the best cook win. "A Cooking contest eh. Great place to recruit a cook for me ship." It was a lazy afternoon and me ship was passing a familiar coast. I had explored most places on this side of the sea so a new place always called itself out. A small shack near the sands caught me eye and I decided to explore it. The boys docked near a cliff as a small landing party left for the land. IndiKitchen is a portmanteau of Indian Kitchen as opposed to Independent Kitchen which came to my head first. Blame me for being an Indie game developer(in the past) and attaching the notion of that phrase with "independent". This place is a minimal eatery with an unique theme. As with all Quick serving Restaurants, Indi (Not Indiana Jones) had a small interior dining area. 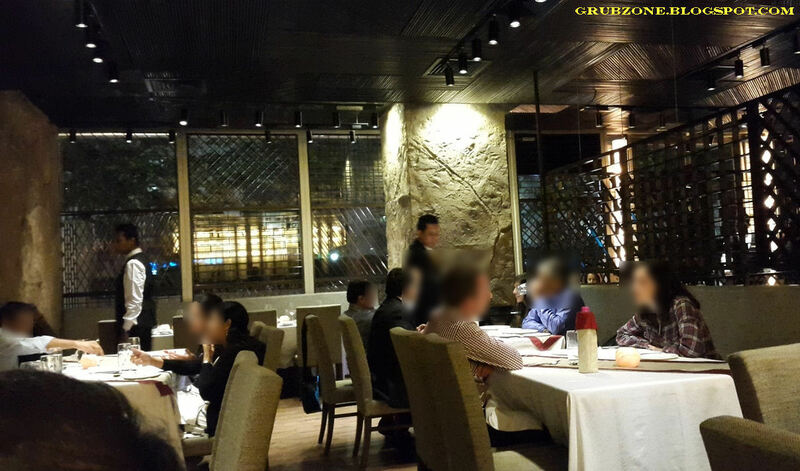 Most of the dining area is outside the bistroesque restaurant. 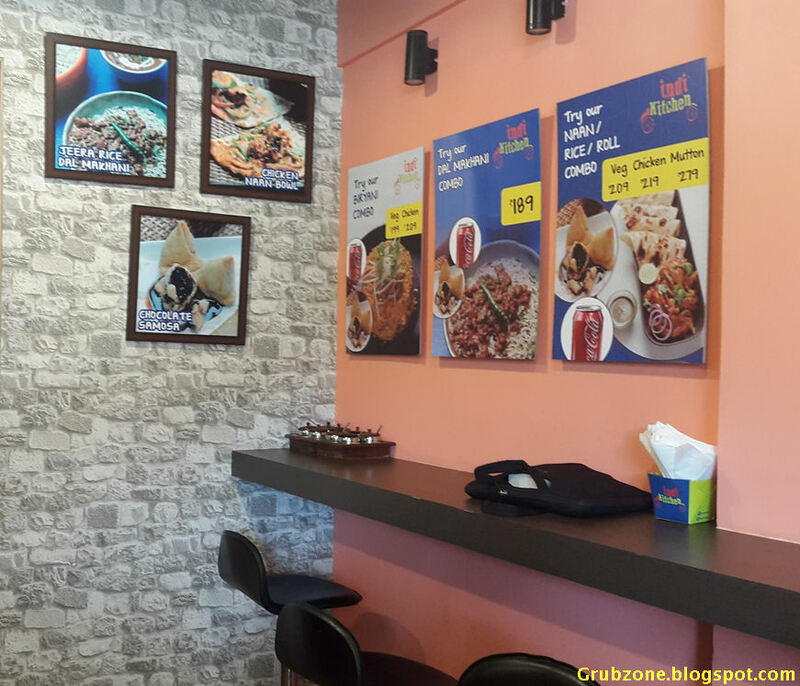 The place introduces the Subway or the "Wok it yourself" concept to Indian food. One can pick their greens, sauces, proteins and breads from a set of choices and see the chef make their masterpiece in front of them. As with all places with this concept, there is a possibility of the eager eater messing up their meal with bad choices. However, Aalok Shah (of Famished Food AP private Ltd) who happens to be one of Indi's four founding partners says that the chef will immediately flag bad choices and strongly suggest the user to avoid unpalatable choices. Whip, wham, sizzle, fry and I see my Chicken Tikka(plus a bit of Bhuna gravy by the chef's suggestion) with Roomali Roti get made in front of me. This allowed me to see what goes into me grub. This is an interesting exercise for those who wish to see how Chicken Tikka is made. 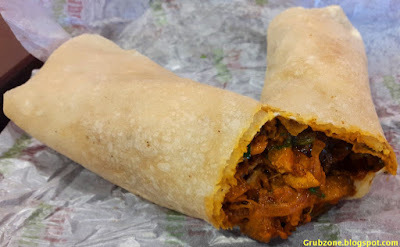 Chicken Tikka - I did not expect it to be served as a wrap but that actually saved me the trouble of getting my hands messy. The Chicken was really good and the quality mimicked the grub found in North Indian fine dines. The only glitch here was that the wrap felt a bit rough for fresh roomali roti. However the meat inside mostly overwhelmed this error. For INR 160, this mostly felt like a good deal. Though the lamb variant is priced much higher at INR 220. Chicken Biryani was the better of the two dishes that I ate. 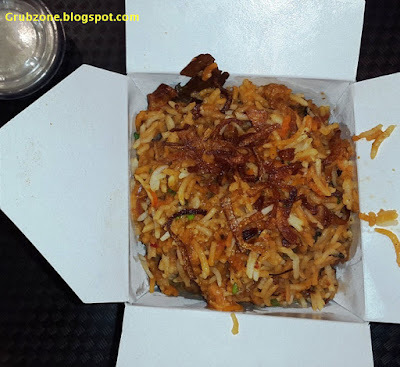 It was one of the finest Biryani preparations that I have ever had. Smooth aromatic rice with succulent pieces of well cooked chicken. 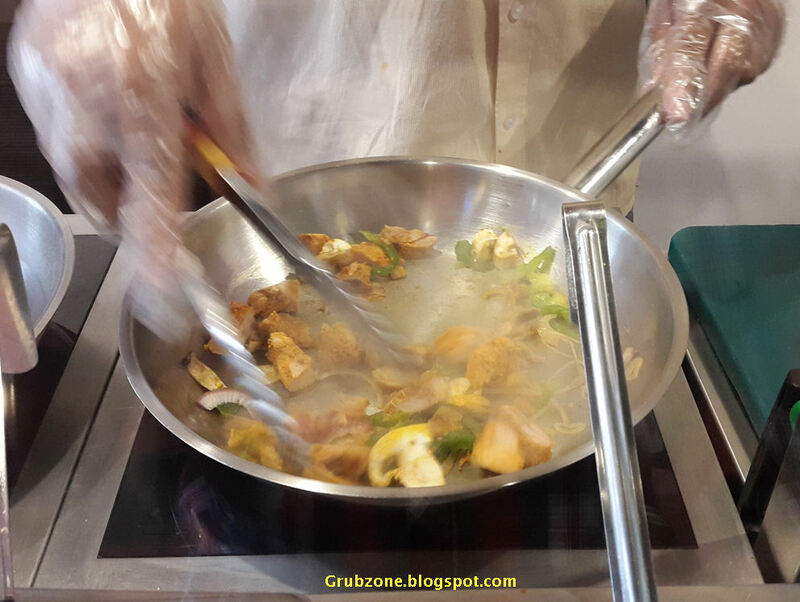 Topped with fried onions, greens and the best spices - This item exceeded my expectations. Indi makes a good stop for a Biryani fanatic. The portion size was quite generous at INR 149. Captain : A wok Box with Biryani. Now I have seen everything. Crewmate : Don't you mean eaten everything? Captain : No one can eat everything. Its like counting all the stars in the galaxy. Crewmate : So have you seen all the stars in the sky then? 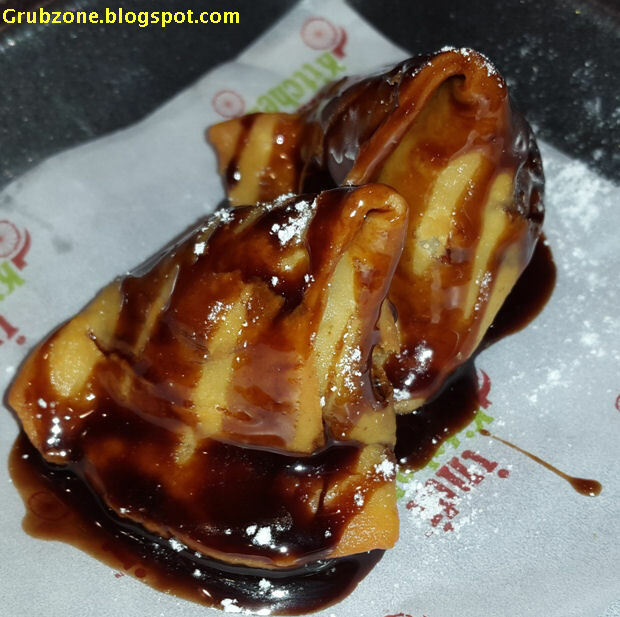 Chocolate Samosa was the lone dessert on the menu. 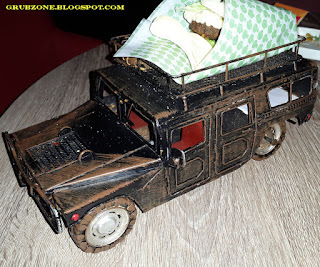 It was intriguing since Chocolate Samosas sound a bit, different. But if one can plug chocolate into bagels, doughnuts and croissants - then samosas should not be a big problem, yes? Well the answer is a mixed one. As a dessert, this fusion works. There however is the issue of salty samosa wrappers and unneeded saltiness to the whole thing. For INR 49, this item is worth the novelty. IndiKitchen seems to be built on a self service model. Though, I was served my items by a server. The pricing is quite low at the moment. For the food they serve, I'd say its one hell of a good deal. Like all good things, its likely that the prices may go up in the future so it seems logical to hog as much grub as possible ha. 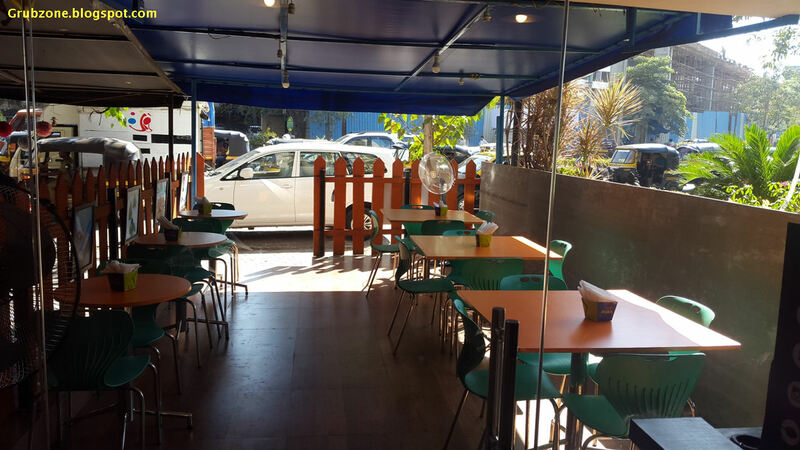 IndiKitchen seems well suited for fellas in the Lokhandwala area. Its quite close to the Infinity mall in Andheri. These folks also deliver to the nearby neighborhoods and the bulk of their business comes from that apparently. "That was a quick sailor's grub lads. Bye Bye laziness, Aye Aye blue seas." It was a stormy night and me ship was rocking to the thundering symphony of the Oceanic Gods. I took out me compass and saw the needle spinning endlessly. This was strange and I wondered where we were heading. The oldest member of me crew, reminisced tales of a sea legend - A magical library. He kept telling me that I will love it. The mates then spotted land nearby and there was surprisingly no storm on that island. Chaos all around the island but peace on it. This be some strange sea magic. I was mystified about this island. My heart beat faster in anticipation. The traffic is always chaotic and annoying on a weekday night when Mumbai's highways and arterial roads are full of vehicles. A fifteen minute journey becomes thrice as long. It was an evening with friends and fellow food folk. All the chaos and irritation ceased to exist the moment I entered Masala Library(ML). Very few places have this effect and ML would be one. 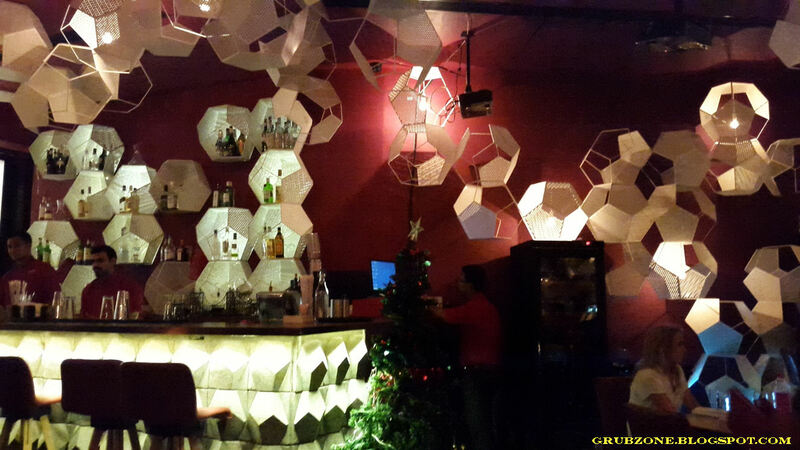 Masala Library is the magnum opus of Massive restaurants and is championed by the legendary Jiggs Kalra himself. The restaurant has a very refined and a dignified appearance. No loud decor or oddities. No experiments with art and the bizarre wonders of contemporary culture. The restaurant was full when I joined my friends and that speaks a lot about its popularity. 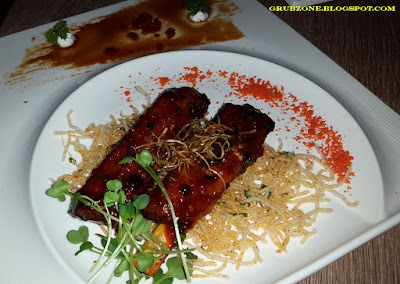 Indeed, Masala Library is considered by food enthusiasts to be one of the finest places in Mumbai. It is a place that must be visited by everyone who calls themselves an epicure of any sort. A long journey makes a sailor(and everyone else for that matter) quite hungry so the evening course started right away. 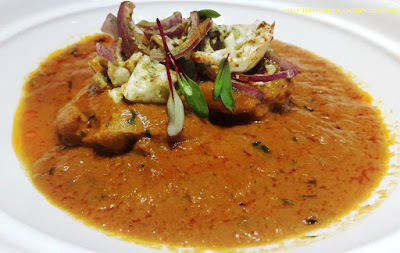 Masala Library calls itself a place that serves progressive Indian cooking. 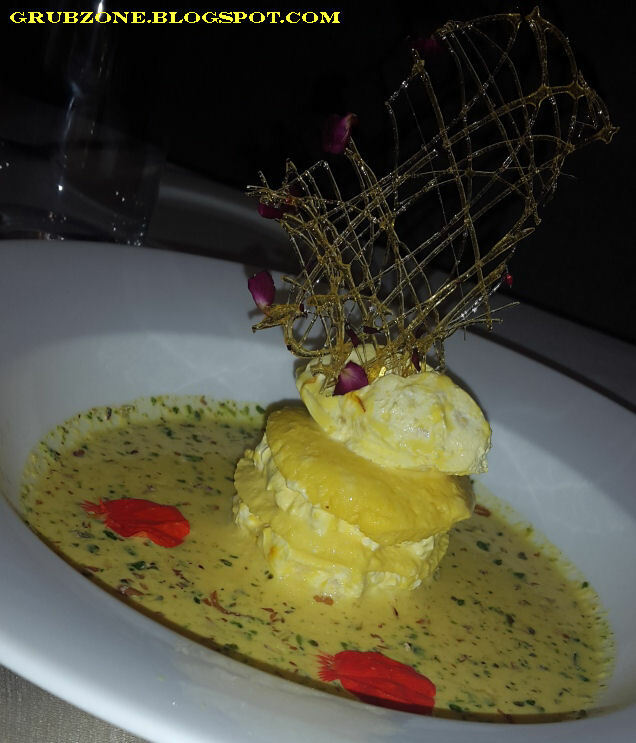 The Indian delights with western influences and Molecular gastronomy prove just that. Masala Library is a place where each dish is like a book and each page symbolizes the culinary depth of the dish. Well time for a long read then, eh? 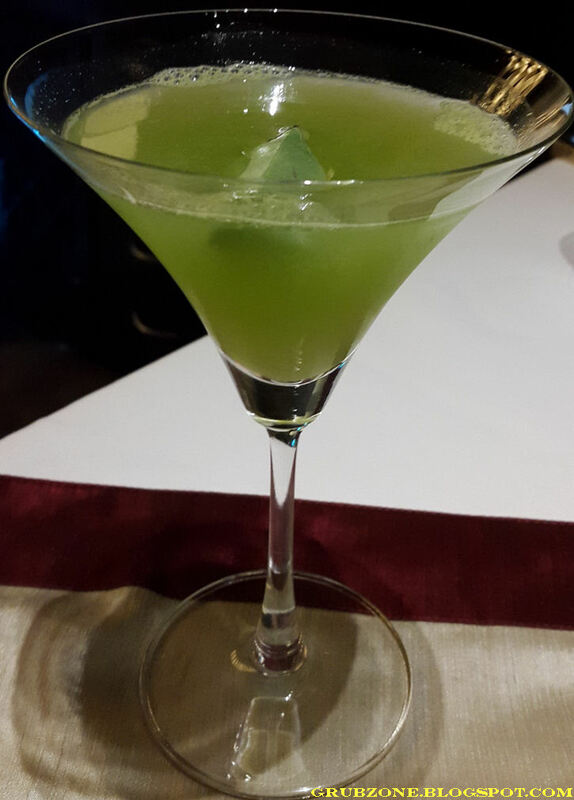 Burnt Curry Leaf Martini - A fusion of the east and west, this martini was filled with the flavor and color of Kaddi Patta or Curry leaves. An interesting taste though a little bitter due to kaddi pattas natural flavoring. 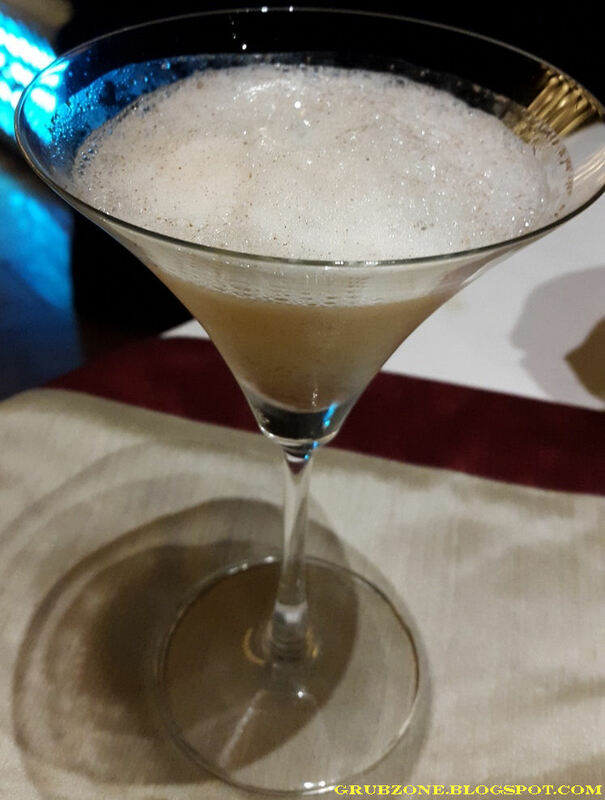 Star Anise Martini was clearly a better martini in comparison. Sweet, fragrant and potent would be the easiest way to describe it. I quite enjoyed it due to my fascination for food and drinks with a perfect infusion of Anise. Before the course started, our group was served with this Amuse gueule. 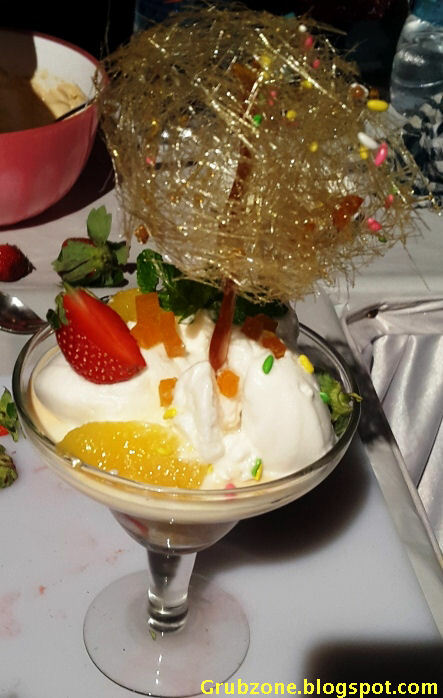 This was made of a "pop in your mouth" Thandai balloon. Masala Library is known to be one of the most proficient users of Molecular Gastronomy in the country. Those techniques were used to make this Balloon. 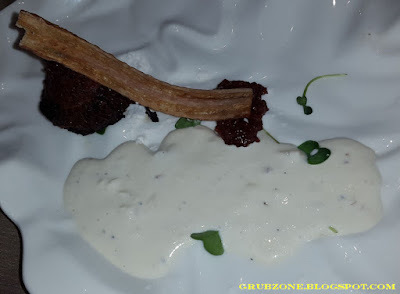 We were served with a Chef's Tasting menu which is a regular feature in their menus. 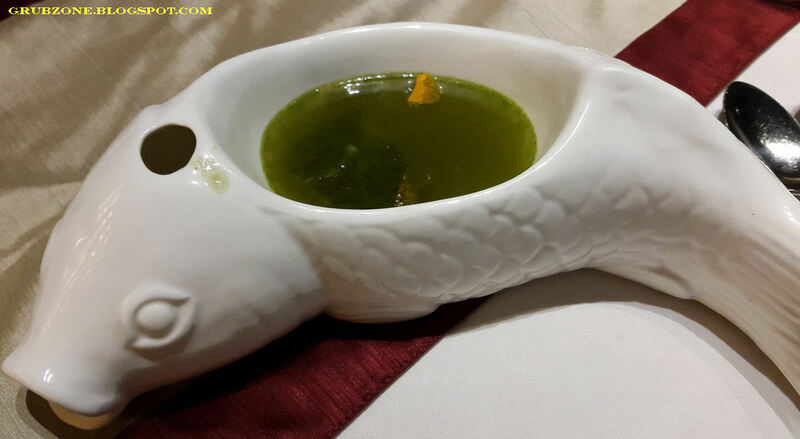 Steamed Patra ni Macchi with coriander shorba was a fusion soup made of steamed basa(cooked in Parsi style) and coriander clear soup with edamame as side. 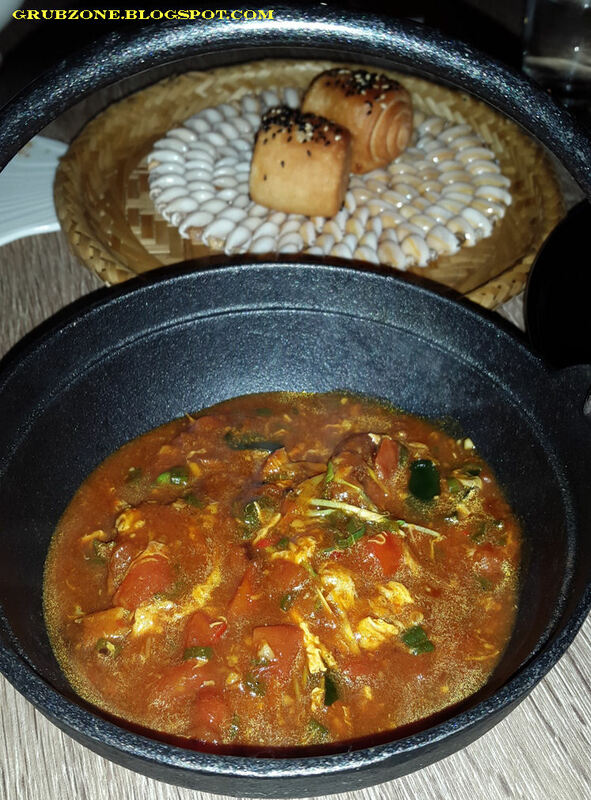 The flavor of the clear soup(shorba) was quite riveting and the basa was completely soaked in the flavor. The fish shaped bowl accentuated the experience. Curry leaf, pepper prawns with Thayir sadam and banana crisps. 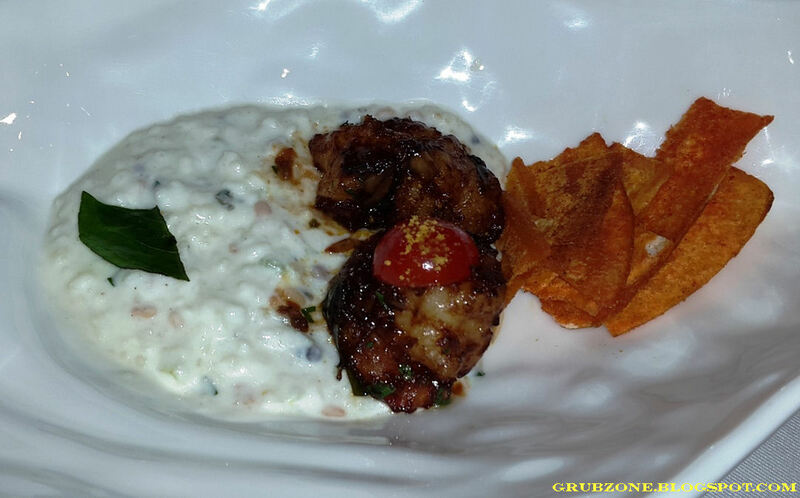 Thayir Sadam or South Indian yoghurt rice paired perfectly with the crispy prawns. This was billed as a salad but felt more like an appetizer. The banana crisps did not seem to blend in well and acted as an unwanted side. Galawat Kebab with Warqi paratha was a "melt in the mouth" mutton Kebab made using a Lucknowi recipe. Legend has it that it was invented by a royal chef for an aging toothless ruler who demanded mutton kebabs. MLs version was loaded with addicting flavors and was quite aromatic too. The plating was nice but I'd rather have a bowl full of this without any need of presentation. This was easily the highlight among the starters. Captain : I love this minced delight. I need a bucket full of these. Crewmate : Yeah, I could use a bucket too. Captain : Good, that make it two buckets of kebabs for me then. Crewmate : Don't you mean us? Bacon wrapped Tandoori Morel served with dry Chardonnay carbonara was a fusion of many cuisines. The bacon coat feels amazing as one chews their way down to the soft morel core. The wine kissed Carbonara sauce adds a great finish as well. Food in the image was a tasting portion. 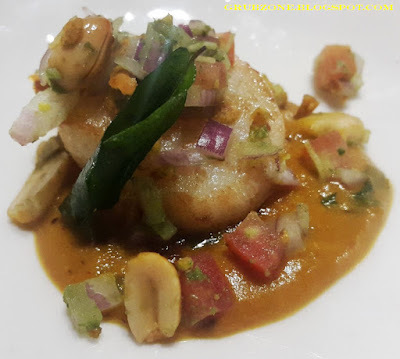 Seared Scallops with Peanut Butter Salan was a delectable dish made out of Norwegian scallops with the South Indian salan curry. The scallops dissolved in the mouth with the peanut butter salan providing smooth and savory sensations on the tongue. This dish was almost like a spa for my mouth. A delight if you are a fellow sea food lover. Piri Piri Chicken Tikka felt like a classical good tikka. Though it was said to have piri piri rubbed on it, that was probably too subtle to be noticed. It was served with a cumin raita and pink ginger. 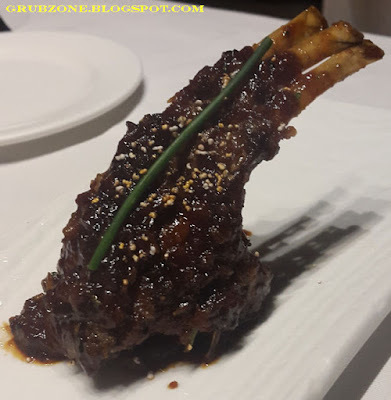 Braised Mutton Ribs - These were braised for four hours apparently and drizzled generously with maple and kokum glaze giving the dish a sweet candied flavor. The meat was soft and full of flavor. This was a risky affair since it combines a popular salty and savory Indian superstar with sweet notes. But it played out well in the end. It was a crowd favorite on the table. 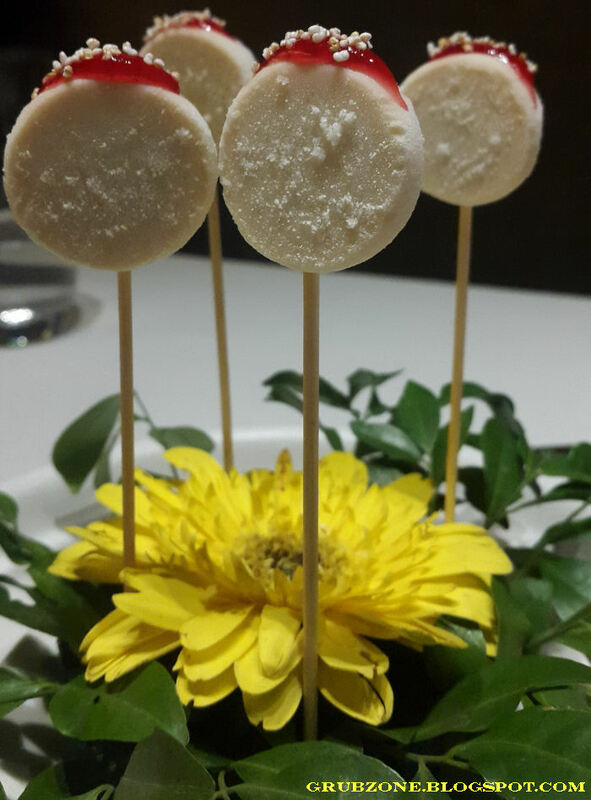 Misti Doi Lollipops served as an intermission between the appetizers and the mains. I have heard so many good things about these and had longed to get me hands on them. These were probably solidified using liquid Nitrogen. 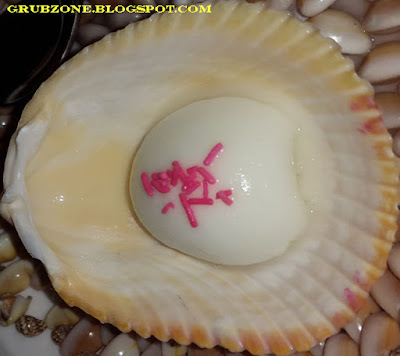 Misti Doi is a famed Bengali dessert but its difficult to make it a candy like solid. These sweet and tangy lollipops were quite possibly the greatest lollipop flavor I have had so far. Best palate cleanser ever. These are not to be missed if one is dropping by ML. Captain : We need to find the restaurant's lollipop vault and grab more of these. Crewmate : And why should I help you cappy? Captain : I'll give ya a ten percent cut. Crewmate : Lets find that vault. Home style chicken Curry was a passable affair. True to its name, it tasted very much like North Indian style homemade Chicken. The question is why anyone would want to have it at Masala Library. There was neither lavish luxury to it nor any interesting western influences. Kashmiri Chili duck - This was a lavish duck preparation with Aloo Bukhara gravy and veri crumbs(spiced crumbs). The duck was succulent and the collage of flavors made this an amazing dish. The duck's flavor formed the outline and colors, Bukhara added a gastronomic depth and the spices added a flavorful variance. My first time with a Kashmiri duck preparation and Masala Library has set the bar high. 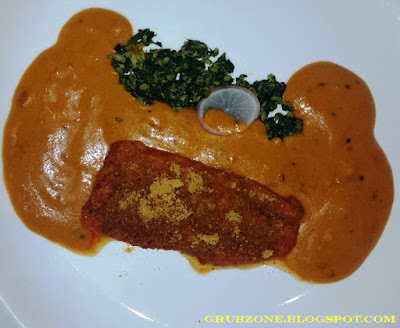 Pan seared Rawas was a delectable preparation of Indian salmon served with South Indian Spinach Poriyal(Stir fried Spinach) mixed with bits of crab. 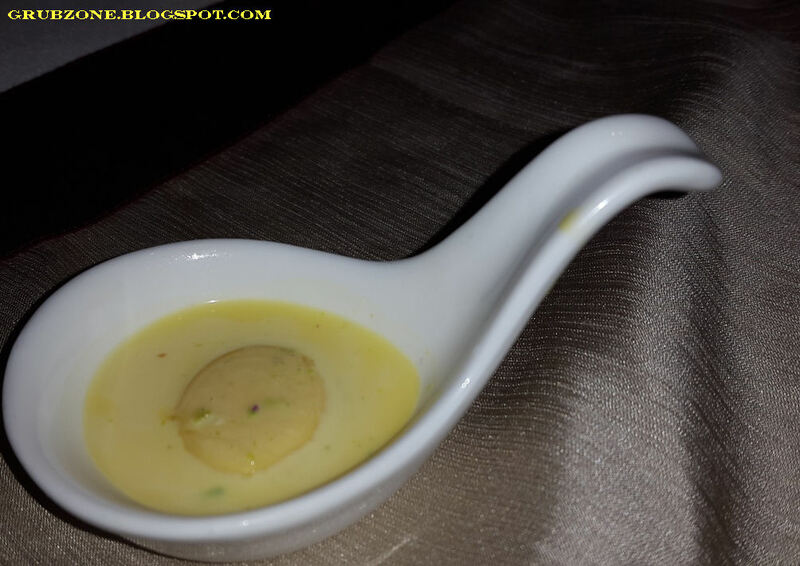 The dish was submerged in Malaya curry which is another South Indian preparation. The dish was a mix of oceanic and terrestrial flavors. It had a natural sea saltiness to it which made the dish enjoyable. While the desserts had their fair share of plating theatrics, I positively enjoyed the dessert more at PaPaYa which is owned by the ML's parent same group. 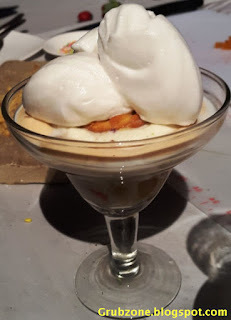 The Ras Malai Tres Leches was quite toothsome with its soft silky Malai dumplings stacked together like a Tres leches cake. 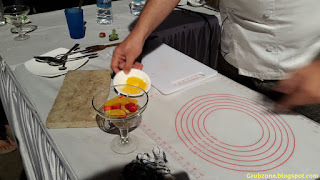 The Ras(Liquid) was made out of sweet milk with saffron, herbs and rose. A caramel structure was placed on the top of it as well. This one was quite an eye candy and it got over within ten seconds flat on the table. Captain : Quite a sight this be lad. Crewmate : Good thing Nina isn't here. She would have lapped up all of that Ras. Captain : Shush, she might hear you. Captain : See , its all yer fault. Her share is coming out of yer share mate. Crewmate : But...but she is your Cat Cappy. 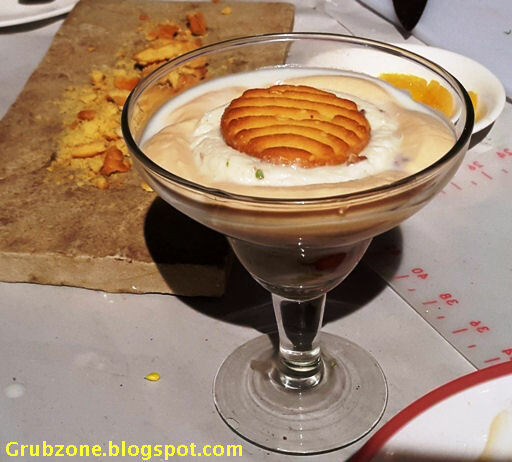 The Jalebi Caviar with Rabdi was a complex affair. I think that there were too many musicians in this orchestra. Jalebi flour had been converted to small spheres using molecular gastronomy and fused to make a disc like structure that resembled granulated Jalabei. The Rabdi was enjoyable. The Saffron foam added to the sweet aroma of the hybrid. But collectively I wasn't too pleased with this one. Paan flavored Cloud Candy. I think its better to call it that instead of cotton candy. 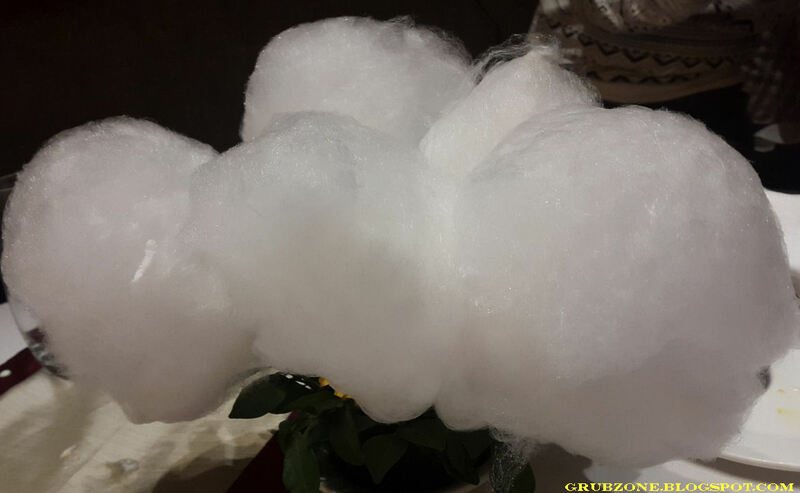 It resembled clouds with its fluffy white appearance. It was quite enjoyable. 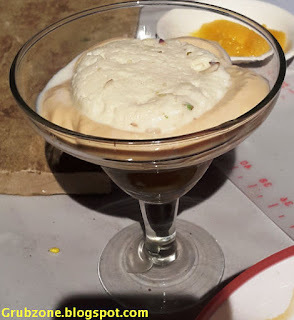 While this may not be the Instagrammer's delight in terms of visuals, it had an excellent Paan infusion and I enjoyed this most among the sweet things. It worked both as a dessert and a mouth freshener. A True Budiya Ke baal moment. The service at Masala Library is exemplary. The servers know their stuff and the floor manager routinely visits tables to describe the food and take feedback. Masala Library is definitely on the higher side of the pricing scales. Heck, it is even expensive. I see that as the only downside. Still the restaurant was packed at my time of visit and not even a single table was empty. That speaks a lot about the quality of the food. ML was definitely a fun experience. The food was great and everything else felt of very high caliber. The ambiance was decent as well though they could do something about the musty smells just near the entrance. I would definitely visit again in the future. "That indeed was something lads. The storm has subsided and me compass has a steady direction too. Flags up and sails out. To the next adventure we must move about." It was an uneventful day with just plain old sea all around us. I sat on the helm with a fishing rod in my hand. I was unlikely to catch any fish but little Nina still cheered me on with her anticipating eyes. The lookout yelled that he saw spotted a skiff tailing our ship. There was a single lad with a smoking carton on that boat. Alarmed that the carton could contain explosives, me gunner took aim at the lad. But the bloke announced that it was just ice cream with dry ice to keep it cold. Ice Cream for me? But by whom? More importantly, there were cups, sandwiches but where's my cone? I was sent a carton full of dry ice, ice cream cups and sandwiches. Eager to sample the sweet delight, I opened up the carton with all my might. 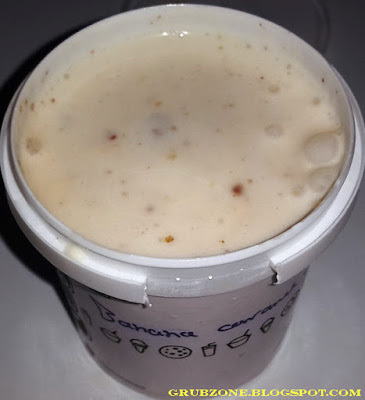 Banana Caramel walnut swirl - Loved the saccharine tang of the banana. The Caramel infusion gave it a toffee like twist. The walnuts were a treat for those in love with the dry fruit. 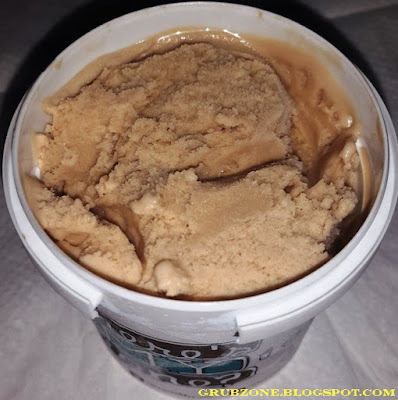 The Ice cream was hand churned so it was extra creamy as well. The flavor felt very natural as opposed to syrupy banana ice creams by certain other brands. 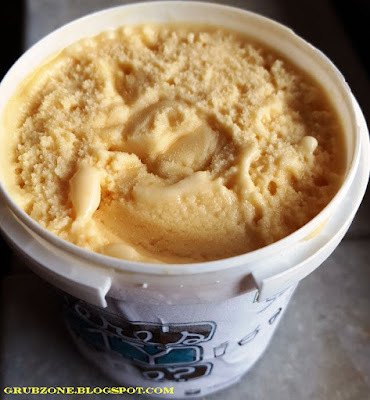 Boondi Ladoo Ice Cream was a slight let down as there were far too many Boondi pieces in it. The flavor was tasteful but the ice cream could have well done without the excess of the famed Indian sweet. The boondi pieces made the ice cream feel rough instead of the smooth hand churned delight it was intended to be. 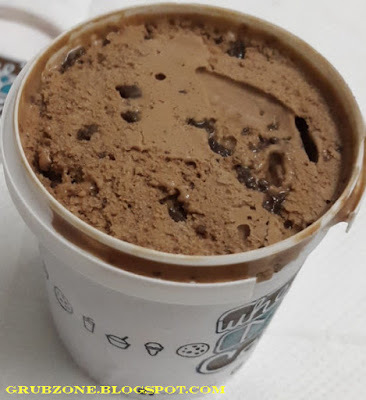 Chocolate Ice Cream - Was a dark Belgian like chocolate ice cream. It had a rich flavor and felt like a premium dessert. 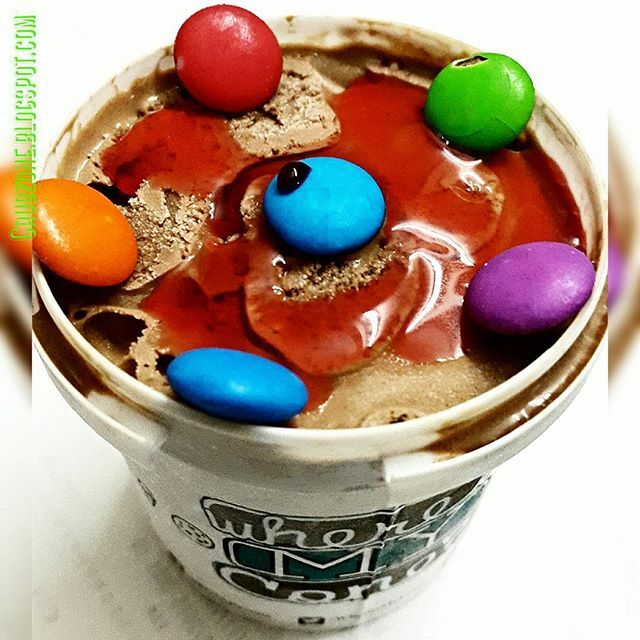 I was feeling a bit creative so I topped it with a bit of marbles and strawberry syrup. The additions seemed to work well with the flavor. Crewmates : Captain, what magic have ye done oer' here? Captain : I was feeling creative lads. Crewmates : So you will let us have it then? Captain : Whaaaat? Why would I do that? Engineer : You know what they say. Can't have your own ice cream and eat it too. Malted Chocolate Brownie was an improved version of the above. Enjoyed this one too though I felt that it could have used a little more of malt and fudgy brownie bits. 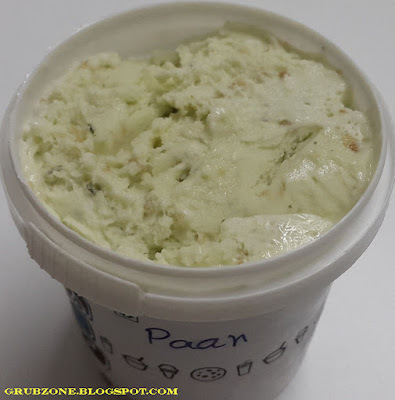 Paan Ice Cream was a very potent Ice Cream in terms of the cooling factor. The Paan infusion was very powerful and I could feel the cold winter in my head with the first bite. I adored this flavor very much and this was far better than the Paan variants elsewhere. This ice cream was topped with some betelnut leaf bits. Filter Coffee was a near perfect rendition of the fabled Indian filter Coffee. The bitter sweet flavor felt like a cuppa coffee royale. This also seemed to pair well with strawberry syrup. I do love myself a cold strawberry infused coffee after all. Great things were expected of the Salted Caramel which is one of my favorite three ice cream flavors. This flavor however felt a little "quiet" as compared to the Caramel variants I have had elsewhere. This was surprising since I enjoyed the same flavor in the snicker doodle sandwich. The best goods in the goodie box were definitely the three Ice Cream cookie sandwiches. These are the things that get people hooked to sweet stuff. 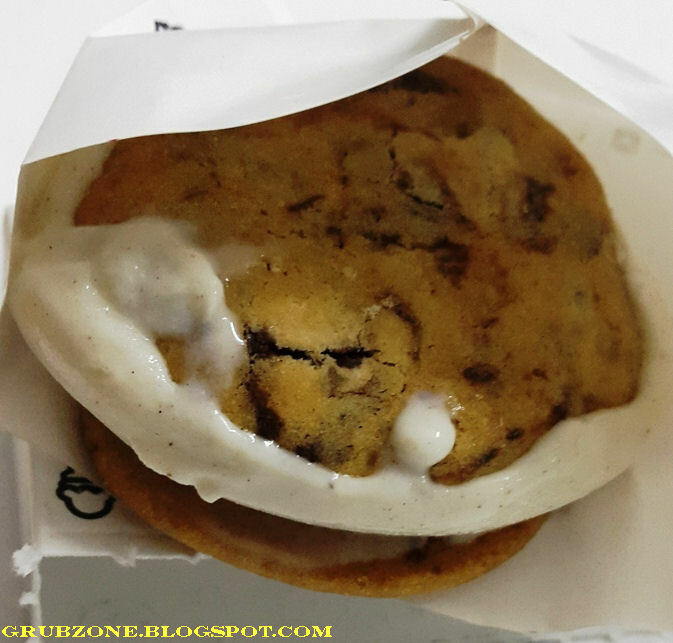 The Chocolate Chip and Vanilla was very good as a complete package. The rich cookie dominated the flavor. 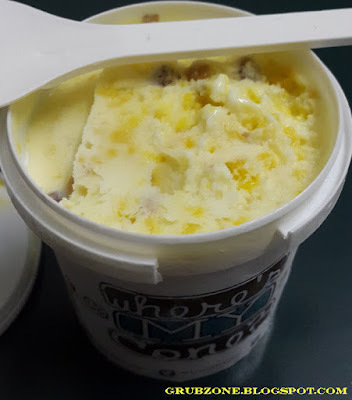 It was almost a cookie flavored ice cream rather than vanilla. 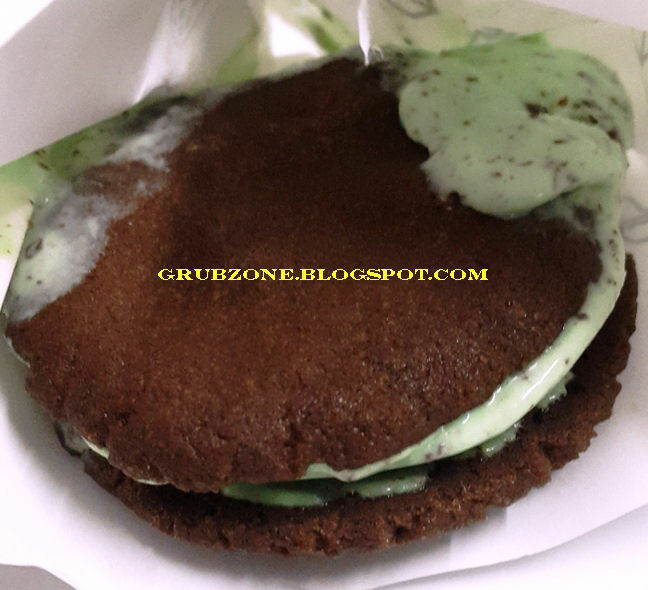 Double Chocolate and Mint Sandwich was the flavor of the pack. The MVP, The man of the match and the player of the tournament. Two rich chocolate cookies which almost felt like slabs of chocolates had a generous amount of green peppermint ice cream wedged between them. I was completely smitten by this cookie sized dessert. Each bite was a full of delight. Captain : These Ice Cream discs be more valuable than Gold Doubloons. Captain : Where did you come from, you sneaky fur ball? Snicker Doddle and salted Caramel sandwich - Made with premium snicker doodle cookies and a dense filling of salted caramel ice cream, this was easily one of the better things in the box. 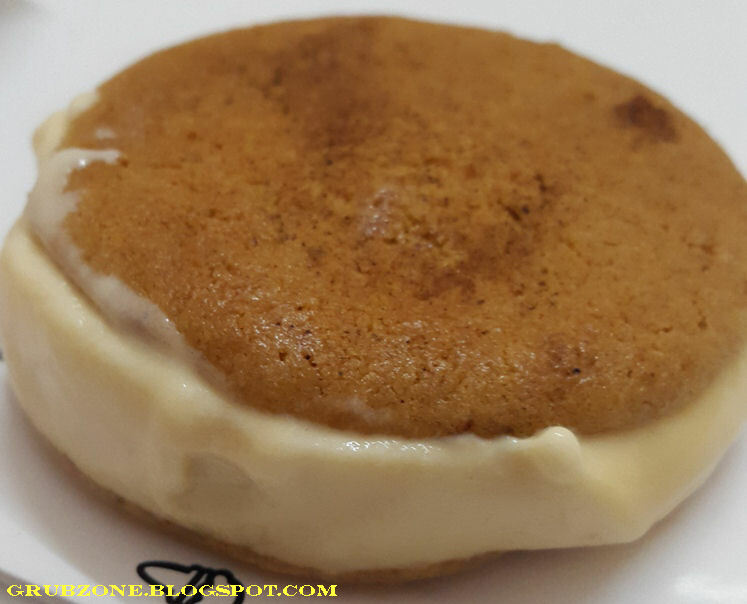 The cookie and caramel blended together perfectly and produced an excellent composite flavor. Another delight to look forward to. Each bite had the ice cream oozing out of the cookie edges. It was a mess one would love to see. The Salted Caramel strangely felt much better over here as opposed to the cup variant. Captain : I love me some Sea Salted Caramel. Quartermaster : I challenge you for the possession of these delights Cappy. Captain : All right. How do we settle this ya big brute? Captain : Uhh..How about Chess mate? The pricing at "Where's my cone?" seems appropriate. The cups feel cheap while the sandwiches are a little more expensive. But I am willing to spend INR 107 for a double chocolate mint sandwich any day. The desserts were quite good. The quality easily left behind the likes of Baskin Robbins or Gelato. And it seemed worthy of the money spent. The brand is still a fledgling but I expect it to grow and have many outlets all over the city in the future. I sure could use one outlet near my home, ha. "A box of Ice cream a day keeps me crew happy the sailor way." Labels: Andheri, Boondi Ladoo, Dessert, Grubzone, Hand Churned, Ice Cream, Ice cream Sandwich, Mint, Rishabh, Sancha, Where's My Cone? Before going on longer voyages this year, I had me ship in a dock for repair and upgrades. The first entry for this year be a place called Pa Pa ya. Eh, is it the fruit or does it mean something more? Intrigued, I decided to raid the place and grab the grub. The boys were busy with their deeds on the land and I went alone for a change. More grub for good ol' me. Or so I thought. This was my first foray into any establishment owned by Massive Restaurants, the group behind fine dines like Masala Library and Farzi Cafe. Its helmed by Zorawar Kalra and his father - The legendary Jiggs Kalra - an icon amongst Indian food journalists and writers. Papaya is located in the prime area of the top floor in the Palladium mall. Over here, it faces many other giants like Mainland China and Social. Despite being located in a mall, it would be unfair to dismiss it as another "Mall restaurant". It comes with its exclusive own gold class and excels on the one aspect that matters the most, the food. Pa-pa-ya is a dim lit restaurant with Dodecahedron like structures (representing molecular gastronomy) hanging all over the place. The lights are often hidden inside one of these structures providing an interesting visual. Though the place is small, the decor does make effective use of the space. Despite the limitations, Pa-pa-ya still manages to put in a popular bar and a sushi counter inside. Since this was a blogger's invite, I was served almost all of the house specialties. My host and server Manish was both professional and well informed. He knew the dishes and their ingredients well and he guided me through a journey involving a fusion of Asian and western delicacies. Yep, this guy was a walking foodipedia. The Service was amazing as far as I can judge. Nigiri Sushi tree was a masterpiece created by Chef Sahil Singh. 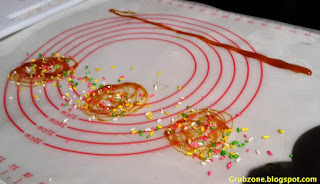 There is a lot of visual science applied in the art of Sushi. Serving it up on a cold plate kind of kills the dish. Serving it on a multilayered tree is both visually enticing and works up an appetite. Tuna, Salmon, Hamachi and Sashimi in the branches from top to bottom. 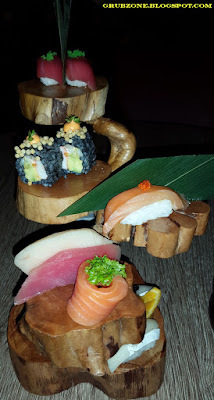 This was all high quality Sushi and it rivaled the sushi that I had in Singapore and the Philippines. Even surpassed those in some aspects. Captain : Hey, who are you? Why are you looking at my Sushi like that? Captain : Stop making those eyes. Noooo...all right ya little pest. You can have some. Carbon Sushi. I particularly loved this piece from the tree set. This was a salmon maki sushi with wasabi. 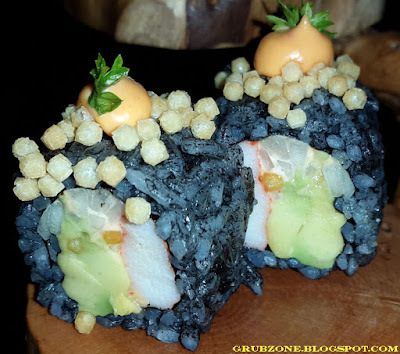 It was coated with squid ink dyed rice and topped with bubu arare. 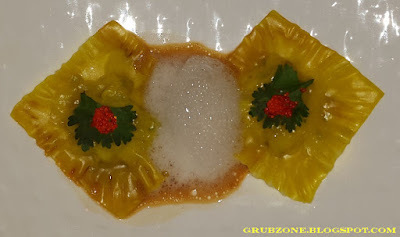 It was crunchy (Thanks to the yellow arare), very umame and had a little bit of savory as well. A light dip in the soya worked well with it. I advise the reader to eat this as soon as its served. It starts to lose its delicate flavor perfection over time. This was by far, one of the best things that I have ever had anywhere in the world. I officially adore Japanese food now. 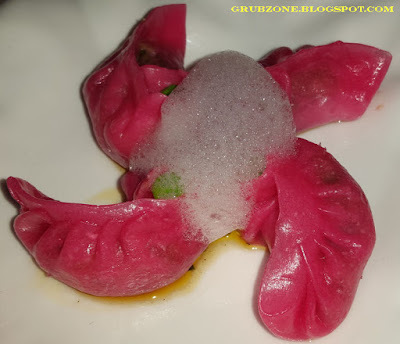 Sauteed Leek and water chestnut dimsums. For anyone who argues that the restaurant does not have quality vegetarian grub, I would simply claim that this person has an unrefined palate. This was a dimsum with beetroot infused wrappers and filled with leeks, celery, water chestnuts and other greens. 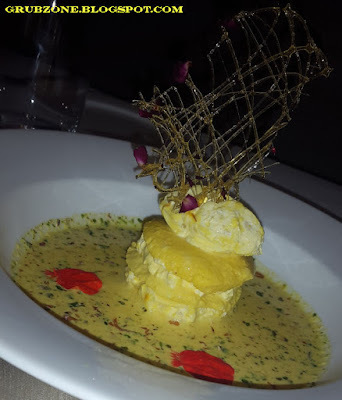 It had a bit of soy with it and was covered with flavored foam made using techniques of molecular gastronomy. It perfectly replicated the umame flavor and was mildly addicting. The wind vane display and the red color definitely attributed to top notch plating. Its amazing what molecular gastronomy can do. Just like Industrial light and Magic revolutionized movie making in the 70s, these techniques are the next step of cooking. We will probably tell our kids tales about the romance and the mystery associated with the origins of Molecular gastronomy. Chorizo Takoyaki was an emperor among kings for me. This was the dish of the night even though everything else was good. These minced Octopus balls wrapped in flour batters are a common snack in Japan but in India these are largely unknown. Blame Anime and popular media for spoiling me. I have been wanting to try these for ages. And what better place than at Pa-pa-ya. 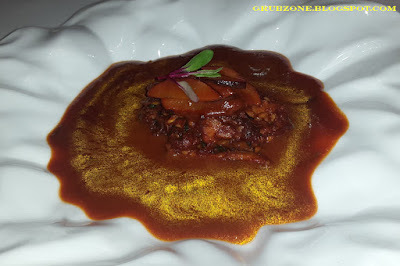 The minced octopus laced with chorizo sauce provided a mix of umame, savory and sweet flavors. The Negi tare or the scallion sauce commonly used in my favorite Yakitori skewers was drizzled generously on this. It was topped with Parmesan and Katsuobushi. Katsuobushi is dried Tuna flakes which tend to dance in the slightest of wind. Applying these added a delicate visual treat to the balls. Captain : These be amazing. The sea has some wonderful treasures. Captain : Whats with those Nyas? Shouldn't it be Meows? Captain : Oh I get it, you are a Japanese Cat. Tuna Tataki Pizza was a visual novelty that tantalized the taste buds too. 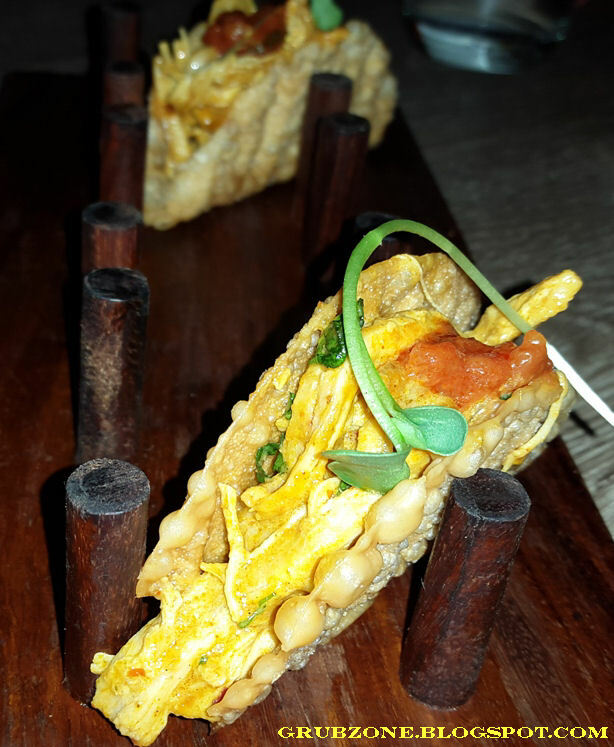 This was made of a thin crispy corn tortilla layered with thin slices of seared tuna and Jalapeno. It was given a finishing touch with the sweet caramel like unagi tare sauce and yuzu wasabi. This dish artfully combined Mexican and Japanese cuisines and produced something capable of sending people to a celestial reverie. Kurobuta Spare Ribs is apparently made from one of the best pork brands in the world - The legend of Kagoshima, the Kurobuta or a Japanese strain of the famed Black Berkshire pig. This is regarded as the best pork meat in the world. The meat tasted sweet as it was smoked, barbecued and drizzled with BBQ sauce. These were positively the best pork ribs that I have ever had. The meat easily came off the bone. Each bite was full of juicy flavor and the meat was well cooked to perfection. Captain : Mm, a good sailor loves a good barbecue. Captain : Come on mate, this ain't even fish. Captain : Whats wrong mate? Captain : Ok ok I get it, you are a little lass. Grilled Chicken and Avocado Tacos was another fusion of the Mexican and Oriental kind. Though this was a great item in comparison with tacos elsewhere, it did however feel a bit flat in comparison with the rest of the PPY lineup. This taco uses Gyoza sheets instead of Tortillas for the shell. Crab and Scallop Ravioli was made of minced crab and saltwater mollusk meat. 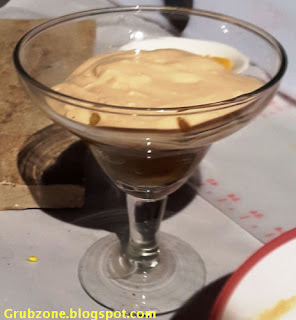 It was dipped in a bit of Tobanjan sauce and was topped with flavored foam which had tones of soya, wasabi and ginger in it. This dish looked amazing though it could have done without the foam which felt as a mismatch in both visuals and flavor. It was topped with some caviar. The dish surprisingly felt a tad bit unsatisfying. It was an interesting fusion of east and west but each parcel somehow felt inadequate. Edamame and chick pea sliders with homemade chips. 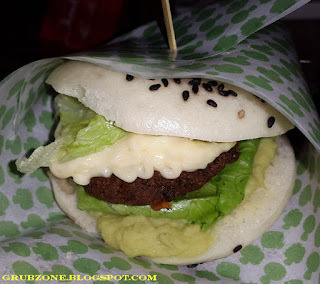 These were delectable little burgers with soft chick pea patties. Completely green and devoid of meat, these things were quite good. The burger buns were made of fermented lotus root flour. There were white and amazingly soft. 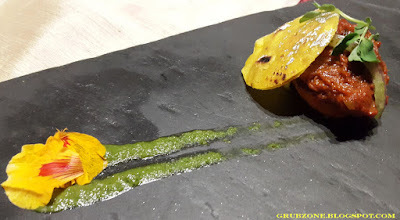 Roasted Aubergine were pan seared aubergine parcels with Chili, sauces and some green stuffing. These were good for a vegetable that I am not particularly fond of. I found myself finishing both of these instead of my usual regulation small bite in case of aubergines. For me to finish an aubergine, it has to be really really good. A treat for the vegetarian. This palate cleanser probably deserves a mention. It was almost a yuzu and wasabi infused ice cream. Ahh, the wonders of Molecular gastronomy. Singapore Chili crab and mantou buns - The dish on its own felt like an ordinary curry. It was made of Sambal and crab with lots of greens. 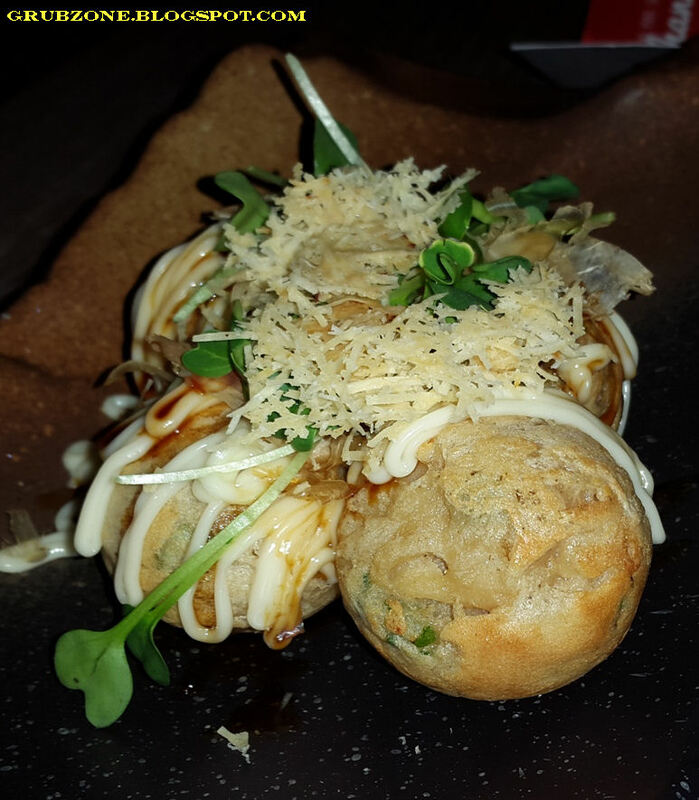 The buns however added a delightful twist to it. The Mantou buns are supposedly a staple in Northern China. Google suggests that these are usually white in color and very light but Pa-Pa-Ya's sweet buns worked well too. These went well with the curry and added the missing flavor depth to it. 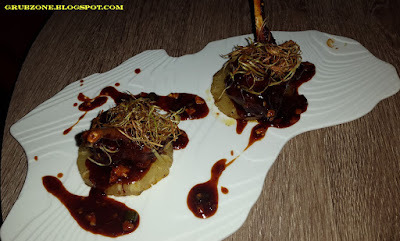 Braised Lamb Chops - These Lamb Chops from Kiwiland are apparently braised for eight hours. Though the meat did not come off easily from the bone (and there was a lot of bone) - it still was full of flavor. The sweet and sour vinegar provided saccharine sweetness. These were placed on top of Caramelized pineapples which supposedly were there to add a flavor depth to it. I however felt that these were unnecessary, at best the pineapple felt like an edible plate. Hmm do ya like me dessert mate? 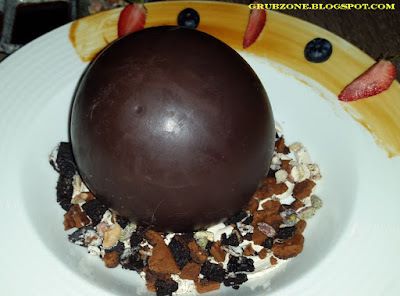 The Flaming Chocolate Ball is becoming increasingly popular at fine dines. 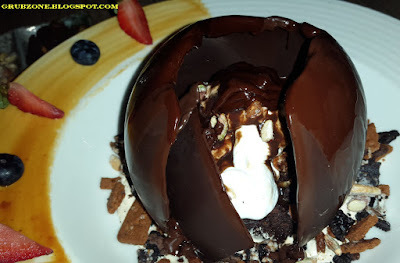 The version here looked like a grand dome of chocolate. Manish then poured some burning sambuca over it and the dome melted away to reveal a delectable concoction of desserts inside. The animation can be found on my instagram. There was a mixture of brownie, fudge, ice cream, cake, nuts, cheesecake and chocolate sauce inside it. 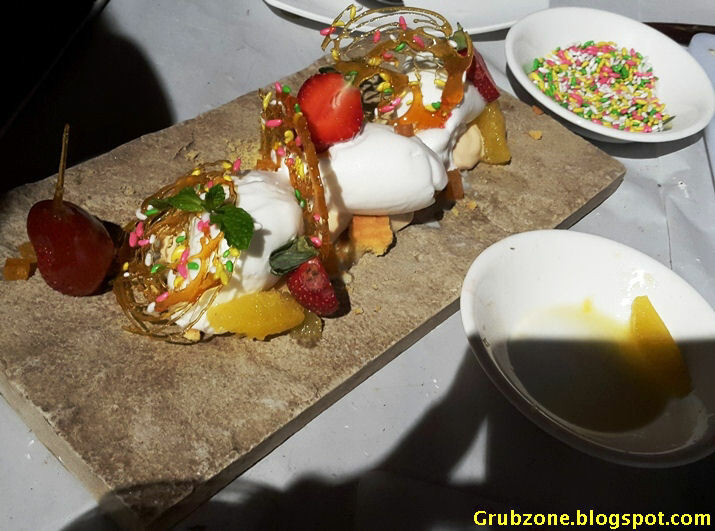 Unlike most places which mess up desserts involving mixtures, Pa-pa-ya got it bang on target. The dessert felt fit for Royalty. Captain : This dome contains a spell of ecstasy, a strong dose of fulfilled fantasy ... Hey Cat stop gnawing at me dessert. Captain : Ah right, chocolate...milk. And I was gonna have me solo night tonight. Where did ya come from, ya cute little landlubber? Pa-pa-ya surprisingly is cheap for the fine dine that it is. The rates are likely to go up in the future given the location and the quality of the meals served but for now these prices are pleasant. Note that Pa-pa-ya is by no means easy on the pocket but on comparison with almost all other fine dines, the food is both superior and affordable. 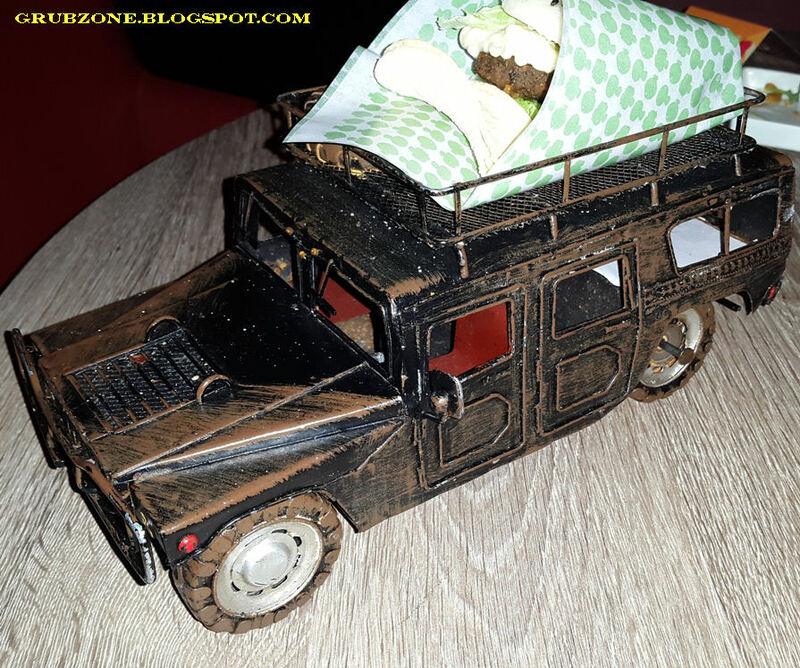 Papaya may not be the best place for an ambiance - The atmosphere is loud, clustered and there is no partition between the mall and the restaurant. The food here however is some of the finest that I have had in India or the world. Best ingredients, a well experienced chef and using all the science behind Japanese cooking results in a genuine Far East experience. As I mentioned earlier, Pa-pa-ya delivers on food. Its easily going into my Top five list for Mumbai. Captain : I am back lads, had good grub and its time to chart our course for the year. First mate : Why is that fur ball loitering around yer leg mate? Captain : This is Nina. She will be joining the crew. First Mate : Ha, so you found yerself a stray and gave it a name too. Captain : We needed a ship cat anyway and this little thing nominated itself for the job. First Mate : Interesting. Lets hope it keeps rats away.